Do you have some cotton balls? And some paper? Then you have a potential snowman and a little French teaching thrown in. 1. 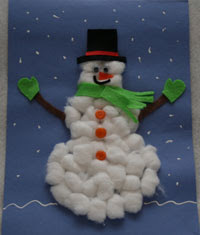 Have your son/daughter cut a piece of paper as big as they would like their snowman to be. 2. Pour out some of the cotton balls and have your child line them up and count them in French. 3. Then, have your child glue them on the cut out snow man, counting again in French. 4. Your child can accessorize their snowman by drawing, coloring and cutting out a hat, scarf and boots. As they color them they can practice their colors and also the names of the clothing.